The shuttle driver, like most critics of the Top 50, was strong on imagery but weak on evidence. Several of my highest-rated courses are on desert or desert-like sites, including Jim Engh’s Redlands Mesa, No. 27 and Medicine Hole, No. 38, Desmond Muirhead’s Mission Hills, No. 44, and Schmidt-Curley’s Southern Dunes, No. 50. * If you broaden the definition of “desert” to include other mauvaises terres, you could throw in arid and mountainous Castle Pines, No. 37, and the two prairie courses, Prairie Dunes, No. 6 and Sand Hills, No. 19, where bobcats and bison run wild. *Several other Top 50 courses are situated in cultural wastelands, but I’m not counting those. Furthermore, my “Seasonally-Adjusted Top 50,” which is available only to pay-service subscribers, is riddled with desert courses. That’s because today, on the 11th of December, Scott Miller’s Cholla Course at We-Ko-Pa Golf Club in Scottsdale, Az., is way, way better than Minnesota’s Interlachen Country Club, which is riding out a blizzard expected to leave a foot of snow on the ground. 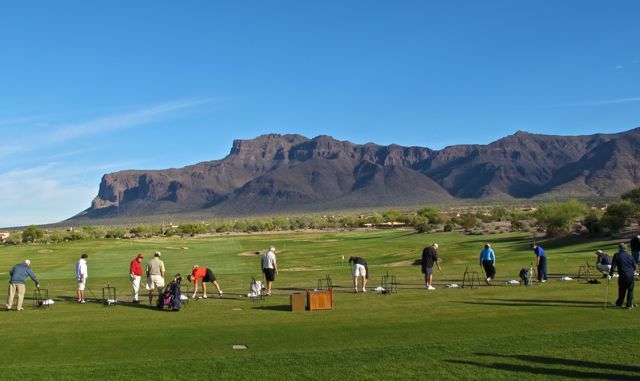 Similarly, the Prospector Course at Superstition Mountain Golf & Country Club, which has hosted Champions Tour and LPGA events in the past decade, is a far better course at this minute than Donald Ross’s highly-esteemed East Course at Oak Hill Country Club. I know this to be true because I have just returned from four days of cutthroat competition at the Xona Golf Media Classic in Scottsdale, Ariz. 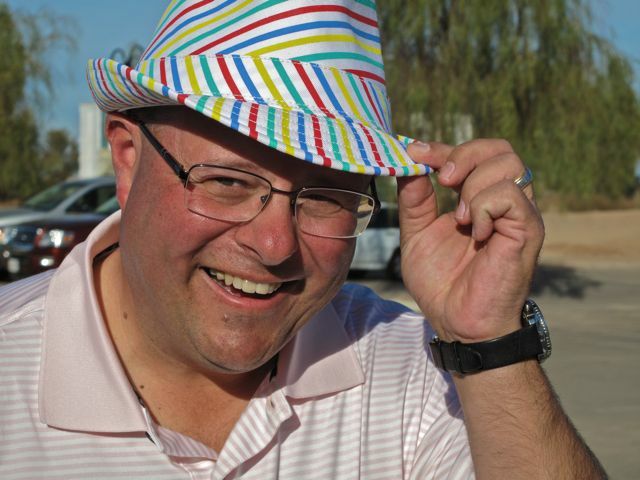 Staged annually by a consortium of desert CVBs, golf clubs and local entrepreneurs, the Media Classic attracts more than a hundred of the game’s top writers and broadcasters to a four-day melee with local club pros, club managers and professional magicians. The intent of the organizers was clear: to promote Scottsdale as “The World’s Premier Golf Destination.” The intent of the invitees was just as clear: to play desert golf by day and to party by night at the Xona Resort Suites, a four-pool facility adjacent to the luxurious Fairmont Scottsdale Princess Resort. While not a celebrity tournament, per se, the Media Classic afforded lucky passersby glimpses of Golf Channel’s Brandel Chamblee, GOLF Magazine’s “Travelin’ Joe” Passov, Sports Illustrated’s Gary Van Sickle (with his touring-pro son, Mike Van Sickle) and legendary Milwaukee broadcaster and college golf coach, Chuck Garbedian. I’ll relate some anecdotes from this year’s Media Classic in a future post, but first I need to share this offer from the Scottsdale Convention & Visitors Bureau. 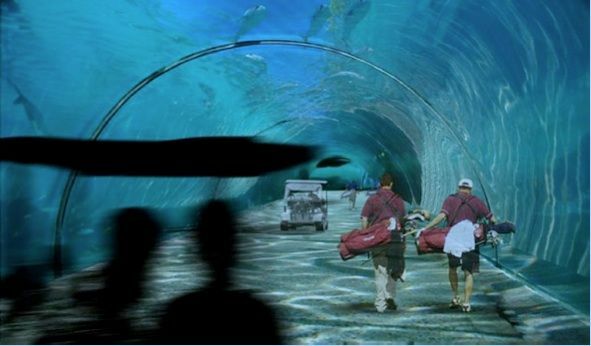 Clicking on the link will take you to a web page offering three free golf trips for two. The free packages include a three-night stay at the Xona Resort Suites, three rounds of golf at one of Scottsdale’s award-winning courses, two 60-minute spa treatments at the Spa at Four Seasons Resort at Troon North, dinner for two at The Capital Grille, and your choice of one of 7 other tourist attractions, such as the Phoenix Zoo, the Out of Africa Wildlife Park or a hot air balloon ride. For additional details, visit www.scottsdalegolfgetaways.com. I’d say more, but my laptop is running low on bold-face type. Bunkered! 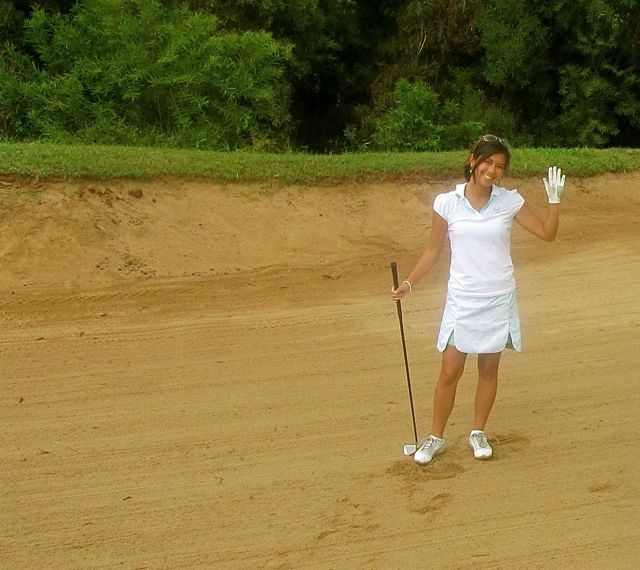 Stephanie Wie in Kapalua's "Garrity Bunker." 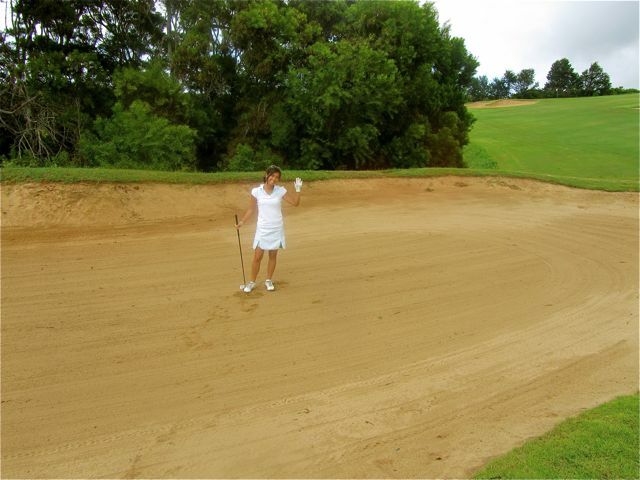 Top 50 on TV: Nothing this week, but I recently received this photograph of golf blogger extraordinaire Stephanie Wie in the notorious “Garrity Bunker” on the tk-ranked Plantation Course at the Kapalua Resort, Maui. (Stephanie is the small, white object stranded in the sand.) The photo was taken during the blogger’s recent round with longtime Kapalua golf titan Gary Planos.